Craniovertebral junction surgery is complex, is anatomical, is biomechanical, is philosophical and needs highest degree of technical expertise and experience. Whilst successful surgery may produce remarkable clinical results and may be compatible with good and new life, any complication can be devastating for the patient and for the family. The advances in surgery in this region have been a result of improvement in radiological investigations and improved understanding of the biomechanics of the region. From decompressive anterior transoral surgery and foramen magnum posterior decompression, the focus is now on stabilization and craniovertebral junctional realignment. A number of techniques have recently been proposed that have wide implications for treatment and provide hope and opportunity for the unfortunate patients who harbor these problems. Craniovertebral junction is amongst the most rapidly evolving subject. Newer understanding is making this subject remarkably result oriented. The current issue in evaluation is the involvement of atlantoaxial instability in issues like Chiari malformation and syringomyelia. 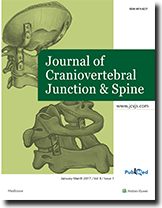 The International society of craniovertebral junction and spine was formed in the year 2014. The first conference was held in Mumbai, India in January 2015. Second conference was held in Brazil, in Rio, in April 2017.